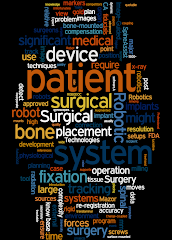 Blue Ocean Robotics and its 2015-established company, LapTics aim to create a robotic assistant for MIS procedures. "LapTics IVS develops and sells the VECLOC - Voice and Eye Controlled Laparoscopy Camera Robot - to hospitals around the world. The VECLOC robot will transform the laparoscopy surgery by introducing an easy-to-use robot for controlling the positioning of the camera during the surgery and with an expected saving of 1 surgeon per surgey-operation performed as well as a reduction in time spend per surgery of up to 30 %. At the same time the VECLOC is intuitively controlled via eye movements and voice commands - and at a market price of less than 50.000€. In 2015, Blue Ocean Robotics and Jens Jørgen Kjer have joined a collaboration on developing a robot arm for laparoscopic surgeries. 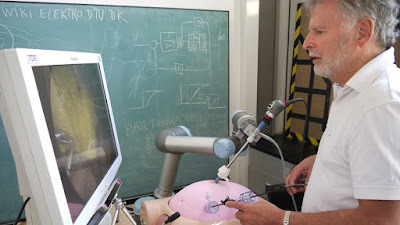 It is named VECLOC - The Voice and Eye Controlled Laparoscopy Camera Robot. The first prototype has advanced to a level where the next generation will be able to be used in clinical trials. As a consequence, Blue Ocean Robotics and Jens Jørgen Kjer founded the company - LapTics IVS - which is now responsible for final approving of the product. The product is a complete laparoscopic robot surgery system, consisting of an eye-tracking unit, a voice recognition unit, a robot arm and a control unit. It is the combination of these units that allows for an improvement of laparoscopic surgery equipment that is based on a combination of our natural senses, voice and vision, which allows the surgeon to work in a natural way. The surgeon does not need to adapt to the system, but rather makes use of already existing eye-gaze information and voice commands in the operation room. Today the surgeon performs a laparoscopic procedure by holding two instruments going through two holes into the human body. To his side, the surgeon’s colleague, often another surgeon, assists by holding the laparoscopy camera. During the entire procedure, this assisting surgeon, waits for instructions to move the laparoscope manually according to the lead surgeon’s commands. With LapTics’ laparoscopic robot system, the surgeon is not performing surgery based on the assistant’s vision anymore, but on his own vision. Claus Risager from Blue Ocean Robotics expects the product to be on the market within the next two or three years. “We will of course start our sales in Denmark, but we already have agreements with University hospital Karolinska in Stockholm and more“. Blue Ocean Robotics is also working with its LapTics IVS subsidiary on the RoBi-Design project, which intends to make laparoscopic surgeries more secure and productive. The product is a complete laparoscopic robot surgery system consisting of an eye-tracking unit, a voice recognition unit, a robot arm, and a control unit. The surgeon does not need to adapt to the system, which uses eye-gaze information and existing voice commands in the operating room. Blue Ocean Robotics expects the robot to be fully developed and ready for the market in two to three years, said Risager. “As was the case with our UV-Disinfection Robot, VECLOC entails exactly what RoBi-X is all about — collaboration,” he said. “Through RoBi-Design, we develop unique robot concepts to solve specific challenges and for realization of unexploited business opportunities in close collaboration with end users.” “VECLOC benefits both the surgeon and the patient,” Risager continued. “Today, laparoscopy requires complex and time-consuming coordination between multiple surgeons and assistants,” he said. “This solution enables the surgeon to rely only on a control unit and his or her own voice commands to perform the laparoscopy.” Fulfilling surgeons’ ‘wildest dreams’ “The procedure will likewise be less demanding of the patient and utilize the time even better,” Risager said. “VECLOC is not only pivotal for the individual hospital, but also for society and the healthcare sector as a whole.” Jørgen Kjer was looking for improvement in laparoscopic operations, where one surgeon is usually the “puppeteer” for the other. Instead, he hoped that they could collaborate better. “Using VECLOC … the patient will experience the operation to be shorter and safer. Furthermore, it will bring better ergonomics and a better focus on the operation for the surgeon,” he said. “This cooperation with Blue Ocean Robotics brings a product of high technological value and at the same time, it fulfils the wildest dream of a surgeon.” Also in the pipeline, Blue Ocean Robotics is working on a robot to lift patients out of beds that can be called by patients themselves, a remote heart-scanning robot, and a bed-transportation robot. In addition, the company is developing drones and a fleet of small robots to assist traffic."